We welcome applications from students from all over the UK and beyond. Entry requirements vary depending on the courses students are looking to study and we advise that you look closely at the subject specific entry requirements found in the prospectus. Generally speaking students must attain at least 5 C grades or above at GCSE including English and Maths too (at Grade 4 or above) and have the capacity to be able to achieve on the courses they wish to study. If you are in any doubt about entry requirements, do not hesitate to contact a member of the 6th Form team. 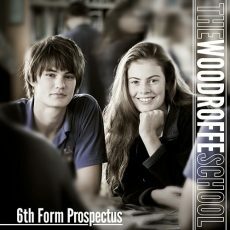 We are fortunate enough to be able to welcome students from other schools into the Woodroffe 6th Form and we hold an open evening in November where further details of subjects that are available can be found, and where our current 6th Formers can provide tours of the school. We welcome visits to the school at any time and these can be arranged by contacting the 6th Form team – contact details below. Application forms are available for download from the website or for collection from Reception for both internal and external applicants. If you have any queries about the application process, once again feel free to contact us. Letters offering places are sent in May. I am available on GCSE results day should you need to discuss any aspect of your application. If you would like a tour around the school please contact the 6th Form Team on 01297 442 232 or email 6formadmin@woodroffe.dorset.sch.uk.